Fiona Forsyth outside Aberdeen Sheriff Court. 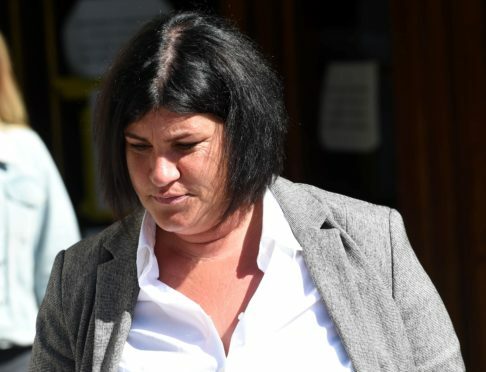 A medical secretary who embezzled from an Aberdeen medical practice has been order to carry out unpaid work. Fiona Forsyth was caught after a colleague at Peterculter Medical Practice went into a petty cash tin expecting to find hundreds of pounds, but found it nearly empty. A subsequent investigation led bosses to discover an alleged £25,048 had gone missing from the books. Forsyth originally denied the accusations, but at Aberdeen Sheriff Court last month the 42-year-old admitted embezzling £8,040.37 between January 2015 and February 2017. The court heard the theft came to light over a carton of milk and a Christmas night out. Forsyth was in charge of ensuring the money going in and out of a petty cash box was recorded on a spreadsheet. When the amount inside fell low, Forsyth would ask practice manager Christine Dowall to put in more cash. Ms Dowall put £200 into the cash box in December 2016, but the following month discovered there was only £60 left. Several days after being confronted, the court heard Forsyth had placed £2,500 into an envelope and handed it to a member of staff and resigned later that week. Forysth, of Dalmaik Terrace in Peterculter, returned to court yesterday to be sentenced. Defence agent Paul Barnett revealed what had caused his client to act this way. He said: “By way of an explanation but not an excuse, she was in a marriage but her husband was in control of finances. Sheriff Ian Wallace ordered her to carry out 250 hours of unpaid and placed her under supervision for nine months. She will also have to return to court next month to face a confiscation hearing. Forsyth declined to comment afterwards.